A Bit Lost is more than a bit lovely. 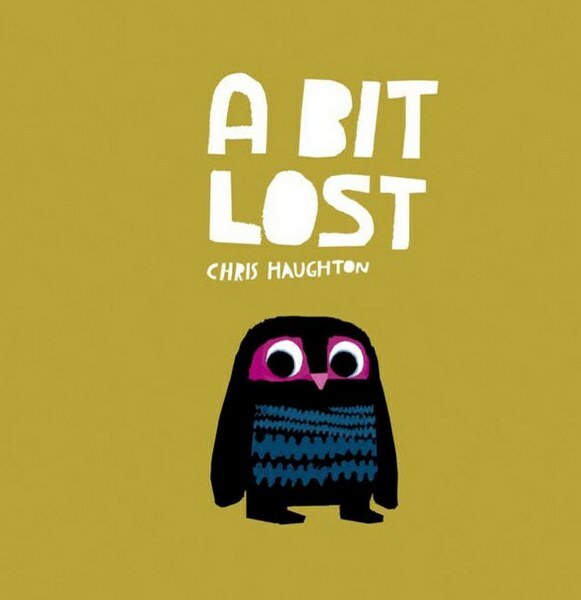 A Bit Lost by Chris Haughton tells the story of Little Owl who has fallen out of his nest and can’t find his mum. He meets Squirrel who happily takes on the task of finding Mummy Owl. 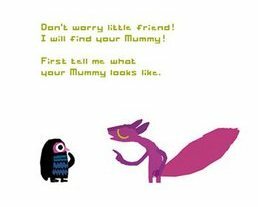 Little Owl describes Mummy Owl and Squirrel presents likely candidates – a bear when Little Owl describes his mum as “big”, a googly-eyed frog when he says that she has “big eyes” and a hare when he recalls Mummy Owl’s “pointy ears”. Eventually Little Owl and his mother are reunited and the motley crew of animals enjoy some tea and biscuits together. Haughton’s illustrations are striking – all at once simple and flat but filled with emotion (the worried eyes of Little Owl, the eager and protective stance of Squirrel, the peevish bear). The exceptionally stunning colour palette can’t go unnoticed – purple, mustard, hot pink and orange that is retro but oh-so-modern. You’ll love it even more when you read Haughton’s account of how the book came about. I’m almost loathe to mention a book that I consider a ‘classic’ – Are You My Mother? by P.D. Eastman, in the same review as A Bit Lost, simply because I suspect that Haughton’s gorgeous story is set to become a classic in its own right. That said, there are obvious similarities, notably the themes of mistaken identity and lost and found. However these themes are interesting, relevant and the perfect mix of scary and funny for kids – which is why both of these books are so compelling. Parents, prepare to read A Bit Lost over and over again. A Bit Lost is suitable for children aged two years and up. Find it at Book Depository for $11.20 (while you’re there, pick up Are You My Mother? for $4.92! ).